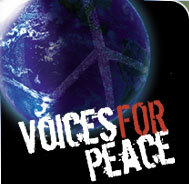 Voices for Peace is an album about peace on earth and the end of warfare and violence everywhere. In his 1961 farewell speech to the nation President Dwight D. Eisenhower, a veteran of 50 years, said, " We must never let the weight of this combination (of the military and industry) endanger our liberties or democratic processes. We should take nothing for granted. Only an alert and knowledgeable citizenry can compel the proper meshing of the huge industrial and military machinery of defense with our peaceful methods and goals, so that security and liberty may prosper together." It is my hope that our voices will remind people that there are those who make great profits from war, thus it is in their best interests to perpetuate it, and that we must always be careful and aware of the influence of such people and organizations. Our album is not in any way a statement against the soldiers fighting in wars and, in fact, is the opposite. The troops are doing their job and putting their lives in harm's way and we respect them greatly for that. We sincerely hope that each and every one of them can get back home safely to their families when the conflicts end, which we hope to be soon. We are not trying to propagandize or to influence anybody towards any particular political ideology. We are not insulting or attacking the president or the U.S. government or advocating any kind of action related to them. Every member of the group that made Voices for Peace possible is a U.S. citizen who cares a great deal about our country, our people and our way of life. We made this album not because we hate but because we love. It is my goal to ensure the money you spend on each album goes directly to the people who suffer most from the effects of war - children, the elderly, the sick and families who have lost members. I chose our charities not because their politics or beliefs might be the same as mine nor for endorsements nor because I am trying to make a statement through them but because they are the best at what they do. Our common goal is the alleviation of suffering. I hope that you enjoy the album, that it helps you find peace within yourself and that you will help peace spread throughout your community and the world.